FeastHome – The green color kitchen can guarantee a warm and colorful feeling all over your kitchen. You can opt for green shades from mint to sage. Just choose any shades that fit the style of your kitchen. Green is the color of freshness and growth. It makes the kitchen close to nature. You can consider having a kitchen cabinet in full green color or a green table, chair, and many other elements. It could also be used as a natural touch to your comfortable kitchen. Psychologically, the color green offers a positive atmosphere to the interior. It represents energy, nature, harmony, and freshness. It’s very flexible to be combined with any other colors. There’s a wide choice of green shades you can have for your kitchen. Check out this eclectic kitchen. It’s got a cabinet with a juicy green shade all over. It brings out the quality of the cabinets. The rustic ceiling is surely the element that decides the style of this kitchen. 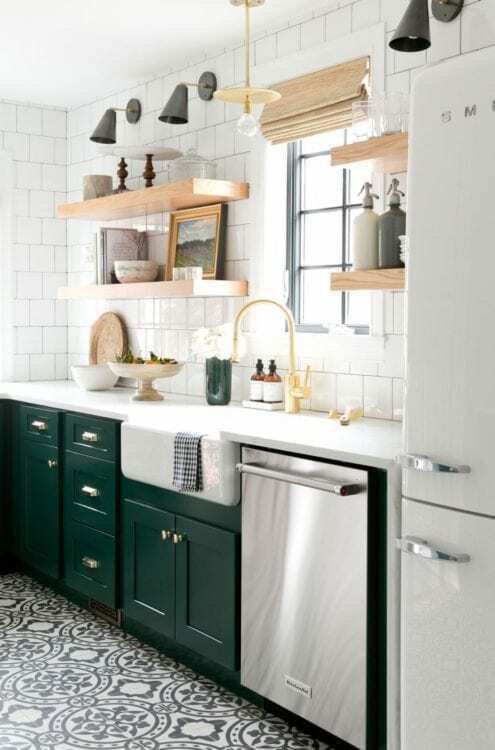 This modern vintage kitchen has subway style white-colored wall which makes the forest green color more perfect. The wooden elements add a more natural touch to this bright kitchen. And don’t forget about the flooring, it looks stunningly beautiful. 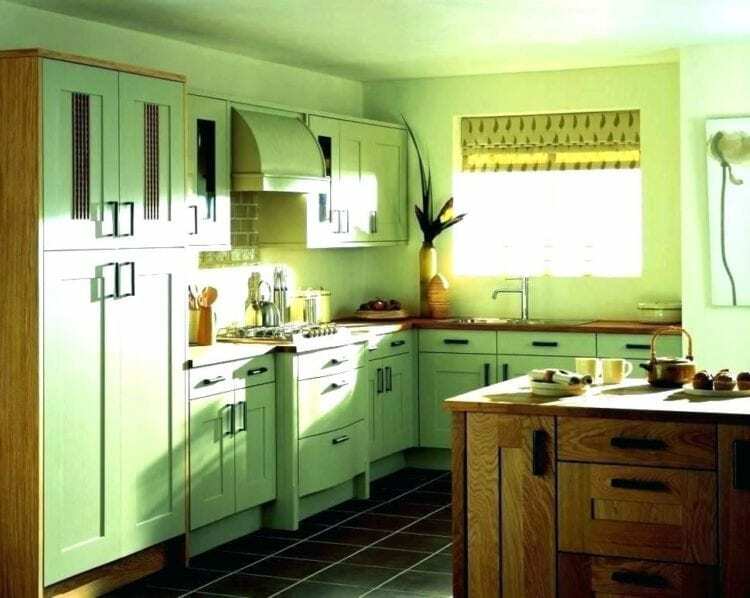 Surely, the main attraction of this kitchen is that green lower kitchen cabinet. It does look beautiful standing between the black elements, flooring, and countertop. Add a floral touch on top of the island counter to fulfill the outstanding experience in this kitchen. Green Apple is shade for cheerful summer interiors. 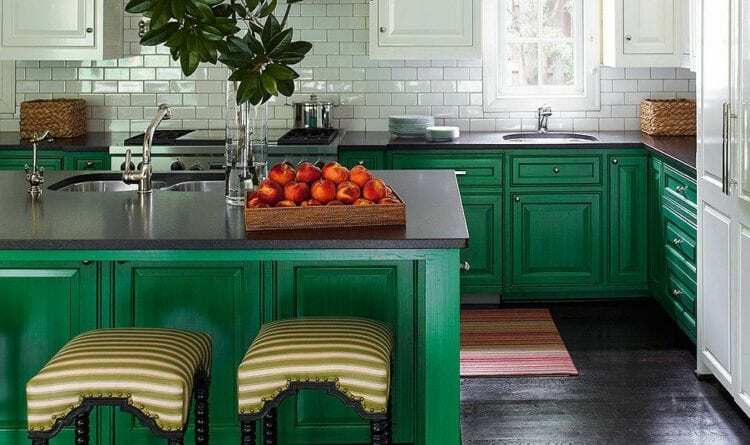 Your kitchen can’t be more cheerful than having apple green as the main color. The kitchen island, cabinet, and decors are colored green. It also has a light blue color on the upper cabinet. The rustic flooring matches the gray color on the countertop. 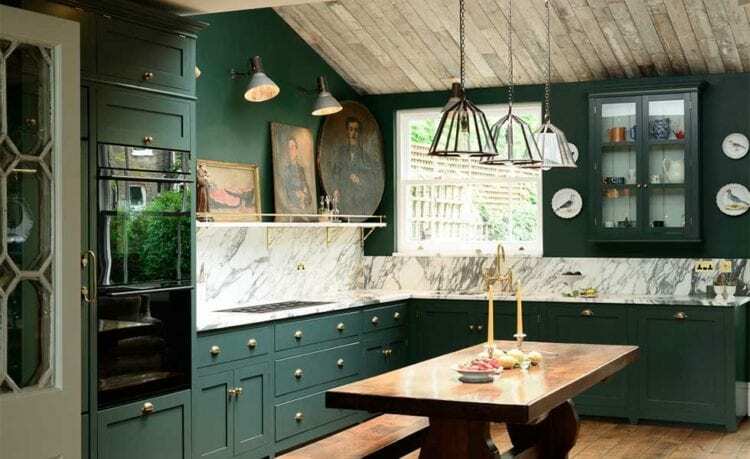 Another forest green option you can have as your kitchen scheme. This kind of shade is quite pretty in the kitchen. It’s applied both on the wall and below the island top. The white cabinet made a great statement in this kitchen. The shade of this sage green is quite antique. However, it’s a great choice to add some freshness into the kitchen. 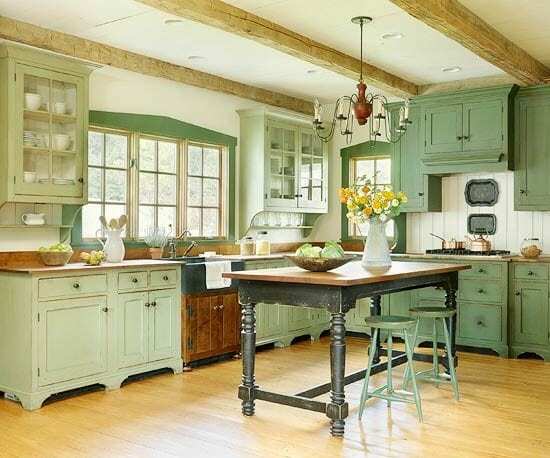 When this kind of green dominates the scheme of your kitchen, the antique and vintage charm would look so stunning. You may add as many wood elements as you like. Because it would really make the kitchen become naturally colorful. It’s quite tricky to find your fancy shades of green. 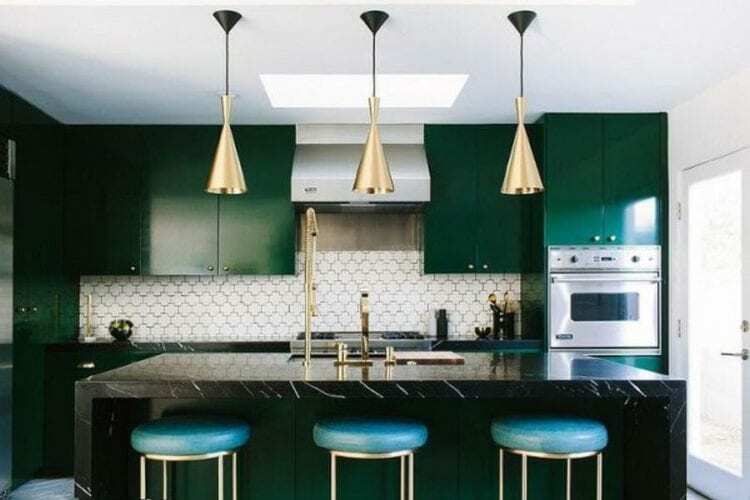 For this kitchen, pickle green shades seem to be the perfect selection. It stays in the lower part of the kitchen alongside the natural wood flooring. 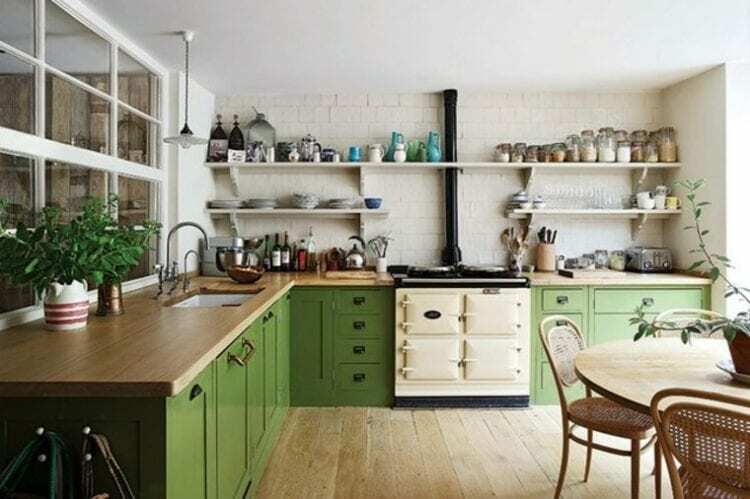 An Aga range cooker fit in the middle of the green cabinets. Check out the upper part of this kitchen. The ceiling is packed with elegant and unique lighting pendants which are ready to light up the room every time. The green shades on the cabinets seem to be matched with the greenery right outside the kitchen. You can see the view through that middle-eastern style of the glass window. The green shade of this kitchen is pretty uncommon. It’s a unique light green that blends really well with the white wall because the shade is very close to white. In order to emphasize the green color of this kitchen, the designer adds some natural green touch from the palm plants in the corner and some green apples on the table. 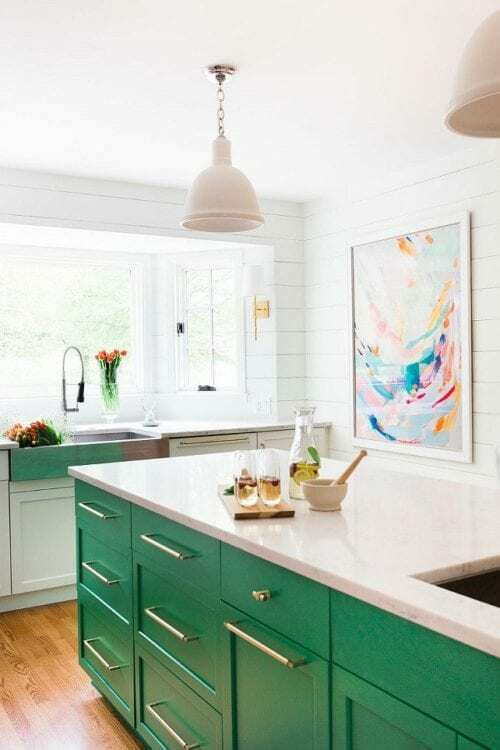 The combination of white and lime green in this kitchen is astonishing. The large scale of the room doesn’t make it seems too big. It provides a comfortable space for your cooking and eating routine in a soothing atmosphere. The color of black in the middle of lime green and white is there to accentuate the combination. 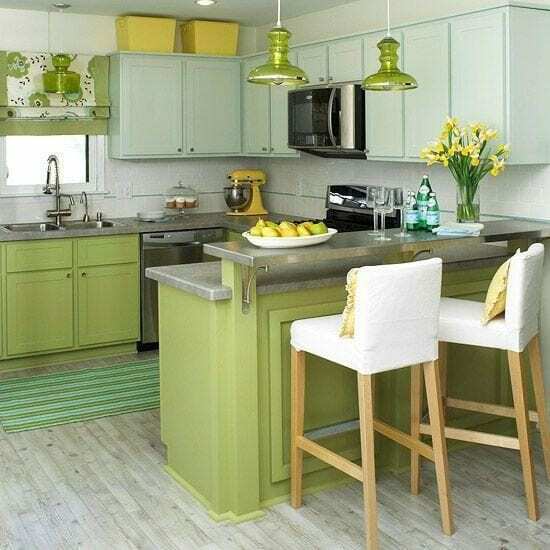 Another idea of lime green kitchen you can consider to apply in your house. In this case, the color of green is more dominating. It’s like the main attraction of the kitchen. As you enter this kitchen, you can feel the bright and energetic atmosphere from the kitchen cabinet. This green u-shaped kitchen has natural energy for you every day. If you want to choose a green shade with a calm and soothing look, sage green is one of the shades you should think about. It works really well the vintage style drawers for your kitchen. Furthermore, it will work really well for the entire element in a room with a vintage style. The color of yellow and green looks totally different. But, they can be good friends when it comes to interior design. 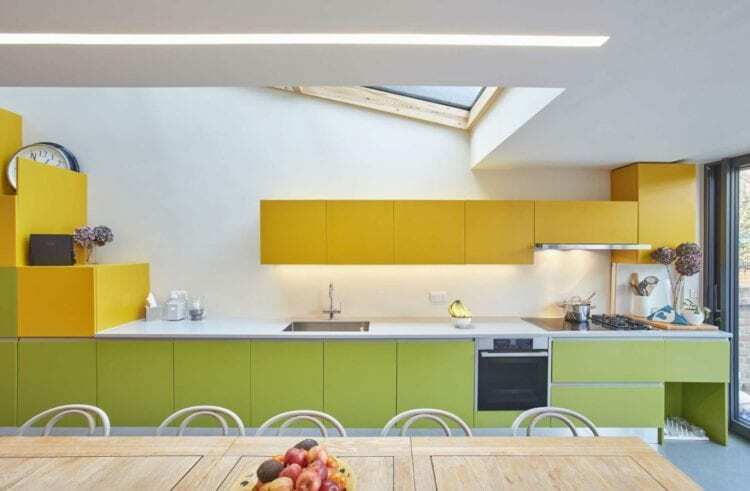 The yellow shade takes over the upper space and the green shade covers the lower part of the kitchen. With white color as the base, these two can even shine better and brighter. They turn this minimalist clean kitchen, into a more colorful and energetic kitchen. This dark combination of dark green and black is astounding. The Sacramento shades look really deep. Choosing this type of shades should make your kitchen ready to take some risks such as the lack of brightness of the room. Olive green is painted all over this kitchen. It’s on the cabinets, the walls, and ceilings. Scientifically, green will make any room feel alive because it’s a resemble growth and nature. These green shades are quite close to yellow. 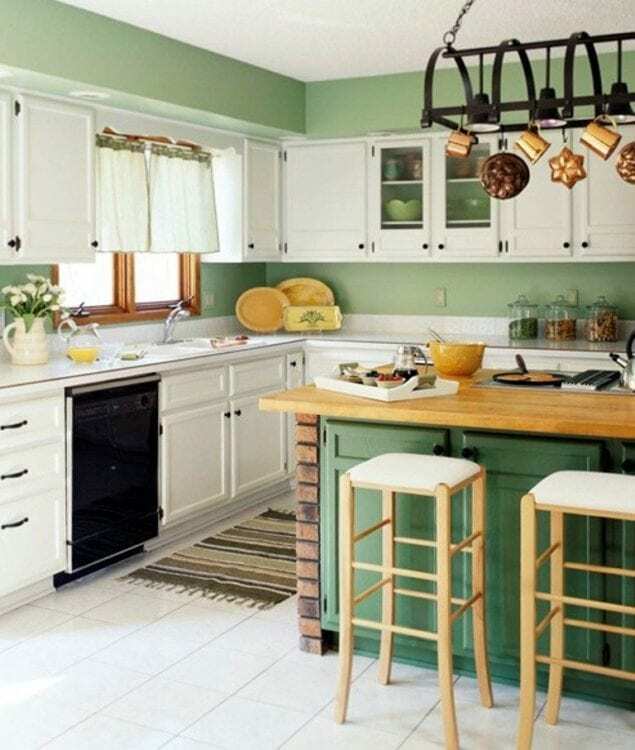 For a soothing and calm atmosphere in the minimalist kitchen of years, you can be modest and choose this green shade. Adding such authentic colors would affect to the uniqueness of your house interior because it doesn’t own by everyone. These jade green shades are a part of Benjamin Moore’s collection. It’s quite special and unique. 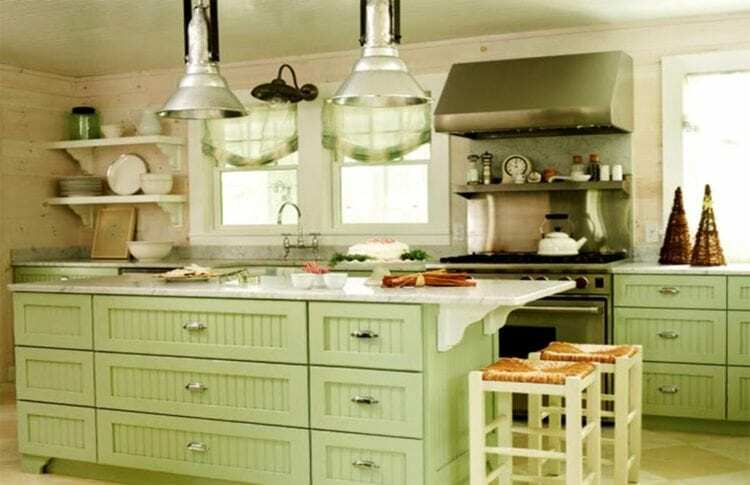 Overall, you can pick any green color kitchen ideas that match your taste of green. Whether you choose green to add nature’s touch or freshness, it would definitely make your kitchen more alive.